Curated by Niels Van Tomme, the travelling exhibition ‘Where Do We Migrate To?’ explores the aesthetic potential of the contemporary nomadic condition.1 The show highlights migrants’ experiences by pushing the boundaries of language and genre in order to endorse the idea that visual art can ‘mediate across the borders and speak in immigrant tongues with multiple accents’.2 Through their differing approaches and various voices – including the interrogation of the multifaceted concept of ‘home’ – this international group of nineteen artists and collectives foreground and frame problematics of globalised twentieth- and twenty-first-century transience. In ‘Where Do We Migrate To?’, immigration and foreignness are reconfigured as universal aspects of the human condition, inviting artists and viewers alike to recognise one another in the figure of the migrant. 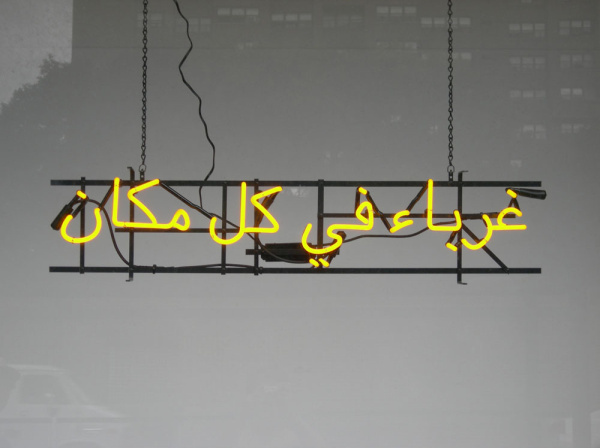 The Paris-based collective Claire Fontaine displays a neon sign that spells the words ‘Foreigners Everywhere’ in Arabic. Since this sign was installed strategically above the gallery’s wall-length window – facing in the street – in the edition of the show I saw, at Parsons in New York, it interacted not only with Parsons’ exhibition site but also with the urban environment beyond it. In recuperating elements of the cityscape, Claire Fontaine’s sign converges with the photographic prints of fire hydrants taken by Svetlana Boym in her Hydrants Migrants series (2007–ongoing). Boym’s New York City fire hydrants are anthropomorphised as they metaphorically ‘speak’ the short texts, typed on white paper, which accompany the photograph of each hydrant. These hydrants are meant to give voice to the stories of the immigrants, including their myriad experiences in new surroundings where they struggle with nostalgia, despair, love and death, all the while speaking in the language of their adoptive homeland. Since 2005, Claire Fontaine’s neon signs have been displayed around the world in numerous languages, except for English. This contrasts with Boym’s tales of the city, which are all spoken in English, a tongue not yet fully mastered by many of the characters in Hydrants Migrants who recount their stories. Claire Fontaine’s sign redefines the experience of foreignness and estrangement as universal conditions, reminding the viewer that we can all be – or have been – a foreigner to something, someone, somewhere at some point in time, supporting the show’s goal ‘to imagine the migrant as a figure, a conceptual entity, through which we may recognise our present-day selves’.3 ‘Foreigners Everywhere’, in calling into question the prevailing notion of the ‘foreigner’ as an outsider, gives new meaning to this term, recasting it as a crucial aspect of the human condition. The Parisian cooperative Société Réaliste’s EU Green Card Lottery (2005–present) is a brightly lit office cubicle situated at the outer edges of the gallery. The installation is nearly inconspicuous upon initial viewing, since this nondescript computer desk and chair, tucked away from most of the exhibition’s other artworks, appears to perhaps function as part of the gallery’s administration. Upon closer inspection of its computer screen, however, one notices the onscreen questionnaire in which spaces are left blank so that viewers can see for themselves what hoops green card seekers must go through in order to obtain legal resident status in the United States. EU Green Card Lottery emulates the United States Diversity Visa Lottery (DV) Program (a.k.a. the ‘USA Green Card Lottery’), which bestows a permanent residency card to 50,000 lucky winners every year. Many more hopefuls, of course, cast their lot. Société Réaliste’s blank form is a stark reminder of the surveillance policies implemented by modern states that use a high-tech bureaucracy to investigate potential immigrants. Is it that ‘home’ could only exist in its mythic forms and representations? In ‘Where Do We Migrate To?’ the impossibility of home as investigated by Fernandes’s video and Schuster’s essay underscores the complex volatility of home as a concept, symbol and reality. Home could be, as in Rousseau’s formulation of the state of nature, ‘a State that no longer exists, which perhaps had never existed, which probably will never exist, and of which it is nonetheless necessary to have the right concept’.5 Yet the desire and search for home is not only a primordial impulse but is also a (post)modern concept/concern: while ‘the experience of modernity has frequently been compared to transcendental homelessness’ by Georg Lukács,6 Novalis imparts that ‘philosophy is really homesickness, the wish to be at home everywhere’.7 As exemplified by Fernandes’s video Homecoming, the notion of home is central to ‘Where Do We Migrate To?’, particularly in its manifestations of how its physical aspect intersects with the metaphysical search for home – in other words, this exhibition explores the human quest for belonging, a quest that bridges the geographical situation of ‘home’ and its philosophical theorisation. Colour photographs interspersed throughout Geyer’s text detail the female migrant’s journey from open spaces along the Californian highways to the urban streetscapes of Gotham City: junkyards, outdoor basketball courts, brownstones, the Times Square subway station, shuttered storefronts as well as the Waldorf-Astoria Hotel during the World Economic Forum. Here, the hotel’s renowned old-world elegance is transformed into a military compound barricaded and heavily guarded by armed riot police. Yet Interim’s opening shots of looming landscapes devoid of human beings are just as cold and alienating as are the images of the urban space itself, depicting the ghostliness, for example, of empty seats in a movie theatre or the empty row of exercise machines glimpsed through a health club window. Voices filtering into the collective unconscious via the media of radio and television circulate throughout Geyer’s narrative, such as a lengthy section of dialogue taken from an episode of Seinfeld (1990–98), which here serves as a trope of the 1990s zeitgeist and highlights the alienating aspects of city dwelling. In another theorisation of ‘home’, Seinfeld’s protagonists discuss the phenomenon of city neighbours ignoring and refusing to greet one another in the communal spaces of their apartment lobbies. An image from Interim embodies this urban alienation: set against a backdrop of high-rise buildings, two people stand near each other yet remain back to back, facing away from one another, never acknowledging the other’s presence. Works displayed in ‘Where Do We Migrate To?’ often require the participation of the viewer, who is invited to offer his or her response to the questions and challenges posed by the artists’ pieces. Amitava Kumar’s catalogue essay ‘Who Is a Migrant?’ concludes by daring the reader to submit a short poem in a space left deliberately blank on the essay’s final page (in emulation of/homage to Bertolt Brecht).13 Kumar’s text parallels Adrian Piper’s installation Everything #4 (2004), an oval wood-framed Plexiglas mirror with the words ‘everything will be taken away’ written in gold leaf letters pasted across the mirror’s face. Since this sentence is thus superimposed upon each viewer’s reflection in the mirror, Piper’s installation emphasises loss as central to the experience not only of migration – when one loses ties to home, family, culture, language and identity – but also to the human condition. Peering into this mirror, the viewer embarks upon an inward voyage, migrating toward ‘the inner space of the psyche’14 in order to explore his/her own catalogue of losses in the face of life’s challenges: the loss of youthful dreams and noble ideals as well as the departure of loved ones serving as a constant reminder that each of us is marching toward the inevitability of death, that great equaliser and what Heidegger called the ‘absolute master’.